The London Film Festival launches tomorrow night and I couldn’t be much more excited if they renamed it the Ultra Culture Film Festival and built a shrine to me in the foyer of the Vue West End. But if you’re reading Sandra, that would be awesome. 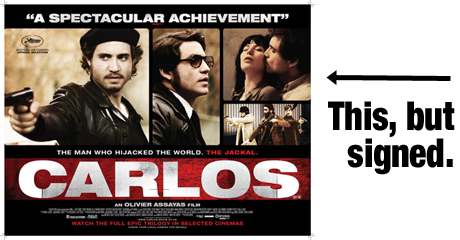 One film I’m especially looking forward to seeing is the 330 minute French crime epic Carlos. I should be enduring it this weekend unless the weather is particularly amazing, so with any luck a review will follow. If you can’t make it to any of the LFF screenings, never fear because the film is released nationwide on October 22nd, and thanks to Optimum Releasing I’m stoked to offer up two posters for the film SIGNED BY THE MOTHERFUCKING DIRECTOR OLIVER ASSAYAS AND STAR EGAR RAMIREZ. The correct answer is Christoph Bach.